Students in Jehnie Reis' history classes recently stepped outside of their textbooks and back in time, trying on women's clothing of the past in class and getting a behind-the-scenes look at the various collections at Heinz History Center. In the Foundations of Feminism class, students learned about - and tried on - bustles, corsets and other undergarments with guest speaker Joan Markert, costume designer and shop supervisor for the University's Conservatory of Performing Arts. "The way that Dr. Reis presents information makes it easy for us to open up dialogue about topics on women I have never had the opportunity to discuss before in an academic environment," explained Danielle Chaykowsky, a behavioral sciences major from Mount Bethel, Pa., who attended Bangor Area High School in Bangor, Pa.
Chaykowsky added: "It's amazing to me how long men have been deciding what a woman should and should not look like, and the lengths women have and will go to in order to fit this standard of beauty." According to Reis, allowing students to see and try on undergarments like bustles and corsets help them better understand the physical constraints women's bodies experienced. "It helps ground the ideas they are reading about in class. History is about the 'stuff' as much as it is the stories," Reis remarked. 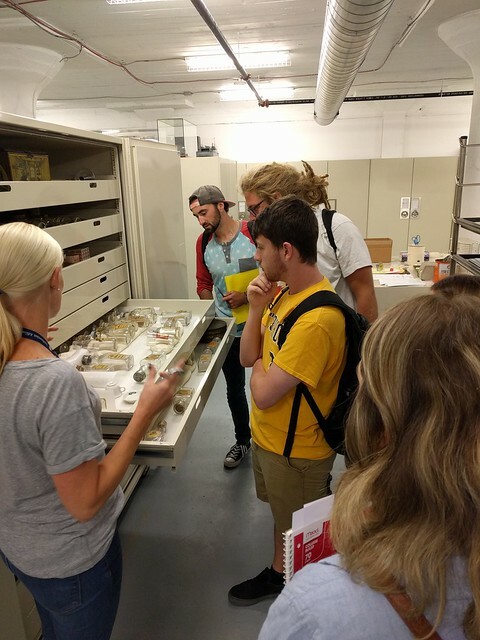 As part of their study on material culture, students in the Senior History Seminar course took a trip to Heinz History Center to examine physical collections and meet with two of the museum's curators. The students also learned about the process of authenticating historical materials and best practices for properly handling these artifacts. Anne Madarasz, director of the Curatorial Division, chief historian and director of the Western Pennsylvania Sports Museum, stressed to the students that all objects chosen for display at the History Center need to have stories behind them. "We ask ourselves, what does this object teach us about the history of Western Pennsylvania and how can we use it?" Madarasz said. "I learned from the visit how carefully every item has to be documented and pictured when taken in by the museum," said Lauren Henry, a history major from Armstrong High School (formerly Kittanning High School) in Kittanning, Pa.
History major Michael Kinley from Central Cambria High School in Ebensburg, Pa., added: "There are so many steps that have to be done to keep these artifacts intact. It was interesting to learn about the coding system they use to keep all of these items." Another highlight for Kinley was seeing Fred Rogers' bench in the Mister Rogers' Neighborhood exhibit. "That was awesome," he said. "Getting behind the scenes at Heinz History Center and spending time with the staff was eye opening. The seminar students had a chance to rethink how they perceive history and sources. It was a lot of fun!" said Reis. Reis, an assistant professor of history, also teaches courses at Point Park on the Holocaust, the history of the Middle East, 20th Century Europe, nationalism and more. All Point Park University students, faculty and staff with valid IDs receive free admission to the Heinz History Center and Fort Pitt Museum.